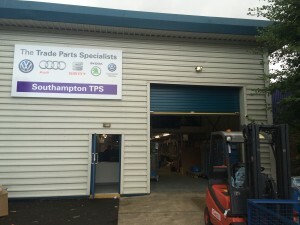 Southampton TPS is part of the Harwoods Group of companies & is a major car parts distributor within the Hampshire area. HMF were asked to provide a design for their new parts department relocation at Discovery Park in Chandlers Ford. HMF surveyed the building & our drawing office came up with a design for a 2 storey mezzanine parts store with an adjoining office area. 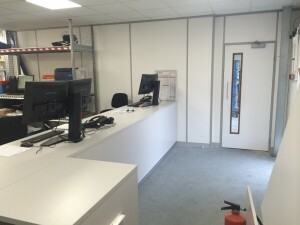 The design incorporated extending an existing open plan office using a mezzanine floor fire rated to 1 hour to enable the telesales/admin area to be located. HMF were appointed as Main Contractor for the complete relocation including all building works, mechanical & electrical installations. 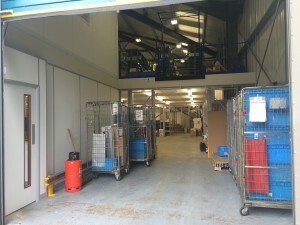 HMF designed a very slim line mezzanine floor to enable the existing 2.5m high shelving to be relocated from their existing store in Eastleigh into their new building in Chandlers Ford. Lighting systems provided included high efficiency LED modular light panels as well as strip batten lighting, emergency lighting & general modulars to the existing configuration. HMF provided the power & data installations for all the voice & data requirements for the business & also ground floor administration areas, constructed from bespoke benching. A new glazed powder coated entrance door arrangement was fitted by HMF c/w manifestations to create a focal entrance point & enhance natural light within the counter area. HMF modified the fire alarm systems to extend across the whole building on both ground & new mezzanine floor levels. New restroom kitchen facilities were fitted by HMF including a new kitchen fitted out with stainless steel sink & quality base units. The heating within the building was upgraded by the replacement of the existing boiler which was upgraded to include heating the new kitchen area & associated toilets/offices. Flooring provided by HMF included heavy duty contract grade carpet tiles which were specified to match the existing carpet colour on site c/w diminishing strips & associated flooring accessories. 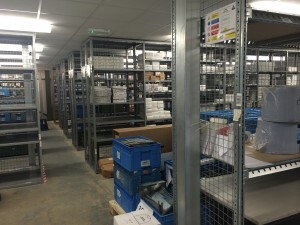 The parts department exiting shelving was relocated by HMF over a 3 week period accumulating in 12 HMF fitters dismantling & relocating the bulk of the existing shelving over 1 weekend working closely with Southampton TPS to achieve a very tight deadline to ensure Southampton TPS were fully operational after this weekend on the Monday morning. Southampton TPS are now fully relocated into their new operational unit which was completed on budget & on programme.